Schizoaffective disorder is a chronic mental health disorder that combines symptoms of psychosis (e.g., hallucinations and delusions) with symptoms of mood disorders (e.g., mania and/or depression). Depending on what type of mood symptoms are present, it is diagnosed as either bipolar type or depressive type. The prevalence of schizoaffective disorder in the population is less than for schizophrenia or mood disorders and believed to be less than one percent. Research suggests that men and women are affected in equal proportions, or that women are slightly more prone while men tend to develop the disorder at a younger age. Individuals with the disorder tend to have periods of improvement followed by periods of worsening of symptoms. It is usually first diagnosed between age 16 and 30 and is rare in children. Whether you have been diagnosed with schizoaffective disorder or are worried that someone you know may have this disorder or has been recently diagnosed, it is important to understand the common symptoms, how a diagnosis is made, and how treatment can help to reduce symptoms and improve functioning in daily life. While the psychotic symptoms listed above describe how schizoaffective disorder appears to an outsider, it is also helpful to learn what these symptoms feel like to a person with the disorder. If you are experiencing disorganized thinking, you may feel like your thoughts are fuzzy or everything feels disconnected. When you speak, you may not be able to remember what you were talking about, so it's hard for people to follow what you say. You may also feel like your thoughts are not within your control. You may think you are being controlled by outside forces like aliens, God, or the devil. You may feel someone is inserting thoughts into your head or that your thoughts are being removed. You might also feel like others can hear your thoughts or access them. You may hear one or more voices that sound real and seem to come from outside you but that nobody else can hear. You might start to talk to them or do things that they tell you to do. In fact, these voices are created by your brain and are not real. Delusions are things you believe 100 percent to be true but that are not thought to be real by everyone else. They may begin all of a sudden or form over time. Sometimes they are related to the voices that you hear and seem to explain them in some way. Most often delusions are paranoid, such that you think people are plotting against you or spying on you. You might choose to avoid those people as it can feel very scary. Diagnosis of schizoaffective disorder is conducted by a psychiatrist or psychologist through a clinical interview. A mental health professional will ask about your symptoms to determine whether they meet the criteria outlined in the Diagnostic and Statistical Manual of Mental Disorders (DSM-5). Before this clinical interview, other potential causes, such as a seizure disorder or drug or medication use will be ruled out through a physical examination, brain imaging, blood test, etc. Schizoaffective disorder overlaps with other conditions so it can be difficult to diagnose. Sometimes, it is incorrectly diagnosed as simply bipolar disorder or schizophrenia. This is why it is important for your mental health professional to have a full history of your symptoms prior to making a diagnosis. 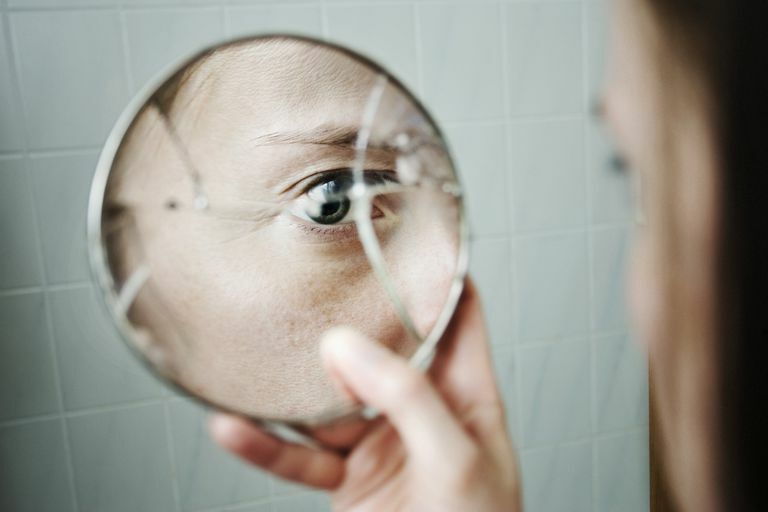 A diagnosis of schizoaffective disorder requires a period of major mood disorder (depression or mania) overlapping with schizophrenia symptoms (at least two of the following: delusions, hallucinations, disorganization, or "negative" symptoms). In addition, you must have had delusions or hallucinations for two or more weeks in the absence of a mood episode. Finally, the mood symptoms must be present for most of the duration of your illness. We don't know precisely what causes schizoaffective disorder. However, it is proposed that it can result from a combination of risk factors that affect brain development prenatally and throughout childhood and adolescence including genetics, brain chemistry and structure, life stressors (death in family, loss of job, end of marriage), psychoactive or psychotropic drug use (e.g., LSD), viral infections including while in the womb, and birth defects. Persons with schizoaffective disorder may also live with overlapping disorders such as post-traumatic stress disorder (PTSD), anxiety disorders, substance and alcohol abuse, and attention-deficit hyperactivity disorder (ADHD). Treatment for schizoaffective disorder can help you to live a more fulfilling life. Treatment may come in the form of medication, therapy, hospitalization, etc. depending on your particular symptoms. Medications such as mood stabilizers (e.g., lithium), antipsychotics (e.g., paliperidone), and antidepressants (e.g., fluoxetine) may be prescribed for schizoaffective disorder. Taking antipsychotic medication will help you to feel calmer as hallucinations and delusions will be reduced. It's important to continue taking medication even if you feel well, as these medications help to stabilize your symptoms and prevent a recurrence of them. Most often, people with schizoaffective disorder need to take medication for the rest of their lives. Therapy such as cognitive-behavioral therapy (CBT), family therapy, group therapy, or skills training may be used to treat schizoaffective disorder. During therapy, you may learn about your illness, set goals, determine how to manage daily issues, and develop skills to interact with others, find a job, manage your finances and home, and manage your personal grooming. If your family attends therapy with you, they will learn how best to support you with your symptoms. In this way, therapy can help you to better self-manage your illness. In the event of a psychotic episode, suicidal ideation, or threats to others, you may need to be hospitalized. There is, unfortunately, no cure for schizoaffective disorder and long-term treatment and management is required. However, medication and therapy can help to reduce relapse and disruption to your life and the lives of those around you. This is why it is important to keep in contact with your doctor or psychiatrist to ensure that your treatment regimen is optimal. If someone you know is displaying symptoms of schizoaffective disorder, it can be hard to know how to help. While you can try to talk to your friend or relative, you also can't force him or her to seek treatment. Instead, try offering encouragement and practical advice such as looking up numbers of doctors to call or investigating avenues to receive treatment in the community. In addition, persons with this disorder may be disconnected from reality. In the event that the person is struggling with basic necessities of life such as food and shelter, or there are imminent safety concerns, you can call 911 and ask to have that person evaluated for treatment. Suicidal ideation and behavior can also be a problem for some people with schizoaffective disorder. If someone you know is in danger of attempting suicide or harming another person, stay with that person while you call 911 or your local emergency number. The other alternative is to take the person to nearest hospital emergency room if you believe that you can do so safely. If you live with schizoaffective disorder and are having thoughts of suicide, call the National Suicide Prevention Lifeline at 1-800-273-8255. If you have been diagnosed with schizoaffective disorder, it is important to learn to notice when your symptoms are worsening and that you may be entering another episode. Not being able to sleep or feelings of paranoia may be one signal that this is happening. In the event you notice symptoms increasing, it is important to reach out for help as soon as possible from your doctor or other mental health professional. National Alliance on Mental Illness.Schizoaffective Disorder. Royal College of Psychiatrists. Schizoaffective Disorder.